Go ahead, subscribe, you know you want to! However, before you do, you need to know. We are going to send you something for signing up. Two ebooks I have developed over the past two years. One is called Entrepreneur Stories. I wrote that over the course or 2016. It includes interviews from several entrepreneurs to find out more about the things that impacted them, their understanding of entrepreneurship, those who helped them, and tips for other entrepreneurs. Next, I have a super duper cool ebook on blog post topics. 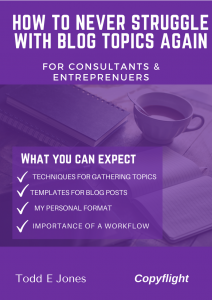 Are you struggling with topics to write blog post? When you sit down to write something, do you just stare at the computer screen with that dumb cursor blinking back at you? Once you are in that position, it can be hard to focus. Thoughts creep into your head and the stress intensifies. You can create a plan, and I show you how with the latest ebook, How to Never Struggle with Blog Topics Again. Dive into the ebook. Carve out a couple hours on the weekend, get you a pen and paper, and start taking notes. By the end of the ebook, you will have at least 25 blog topics to choose from. Now that you know you get something for signing on, let’s get cracking pappy.